We haven’t written anything about ZeusHash for quite a while, since their partnership with Halley China, a large scale mining operator among the top in China. Well, today they have made an interesting announcement that made us take another look at their new offering as it sounds quite interesting and promising. It is a new cloud mining contract for a limited period that has no maintenance fees and at the end of the contract’s period you get your investment returned to you plus you keep what has been mined. 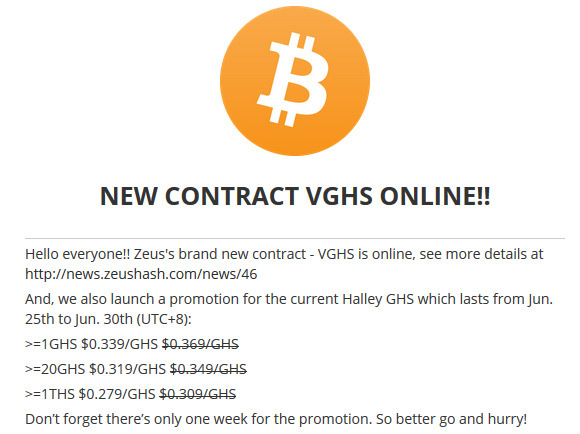 The new cloud mining contract is called VGHS as Batch I VGHS hashrate is being sold for a period of 30 days at a price of $2.999 USD per VGHS. The price per GHS is a bit high for a 30 day period, even with maintenance fees included, but considering that after a month you will get back what you have paid for the hashrate plus what you have mined for that period of time it may not be a bad deal at all. So what is the catch here? Well, the new VGHS cloud mining contracts from ZeusHash do seem more like an investment plan or a loan that users can give to the company and get the mined coins as an interest (currently it means you get about 3% interest for one month). This way the company has 30 days to operate with the money invested by the users before returning them back. It seems that lately this kind of offers are more beneficial for both users and mining operations as they offer more security and less risk than traditional cloud mining deals. So will this bring ZeusHash back in the game or not, it depends on how they manage to work things out with their new offer, but it does seem like an interesting alternative to other offers already. For the ones that are more interested in the traditional plans for Bitcoin cloud mining, there is a one week promotion starting today with a 10% PRICE CUT for Halley GHS that are still being offered. – For more information about the new VGHS Cloud Mining Contracts on ZeusHash….